Product code: W1144 Categories: Sold Items, Sold Pocket watches. Here is a very solid and robust antique 18ct gold full hunter chronograph W. Bennett & Co pocket watch that feels incredible in the palm of the hand. 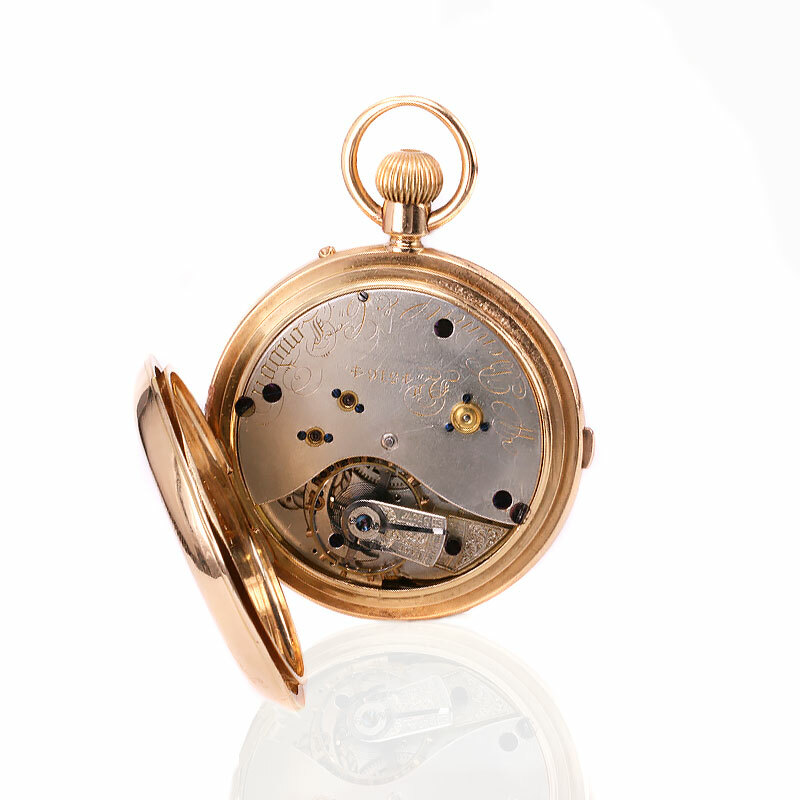 Made in 1886, the pocket watch was made by the eminent English watch making company Bennett and Co. Not only is it a wonderful timepiece, but it also has the chronograph function which is started, stopped and reset by the button near the 12 o’clock position. Once started, the long hand is easy to read and the time passed displayed on the additional counter at the 12 o’clock. With the white enamel dial in perfect condition, this is such a handsome pocket watch to hold in the palm of your hand. Measuring 53mm across by 72.6mm to the top of the bow, there is nothing quite like a genuine antique pocket watch to hold and admire such as this one. Opening the back cover reveals the dust cover which has the most exquisite hand engraving of the highest standard. There is no doubt that this hand engraving is up there with the best of the best and displays the British coat of arms, including the French phrases “Dieu et mon droit “which means “God and my right” and is the motto of the monarch of the United Kingdom and was adopted by Henry V in the 15th Century. And there is the other French phrase “Honi soit qui mal y pense” which means “Shame on he who thinks evil of it”. This term goes back to King Edward III, when Norman French was a common language in the UK. These phrases and coat of Arms is commonly seen in the United Kingdom including on all British passports. And below the coat of arms, it is also hand engraved with Wm (William) Farmer 30 Hunter St Sydney which were the retailers of this fine pocket watch. Farmer and Co, were one of Australia’s leading department stores, that started in 1839 and continued to run until 1960. Opening this dust cover shows the gorgeous movement which has undergone a full restoration, is working perfectly and comes complete with our twelve month warranty. This is such a fine quality antique pocket watch, that with the addition of the chronograph and incredible engraving, will always be such a talking point. Maker: William Bennett and Co. Tags: Antique pocket watch, Antique pocket watch by W Bennett and Co. 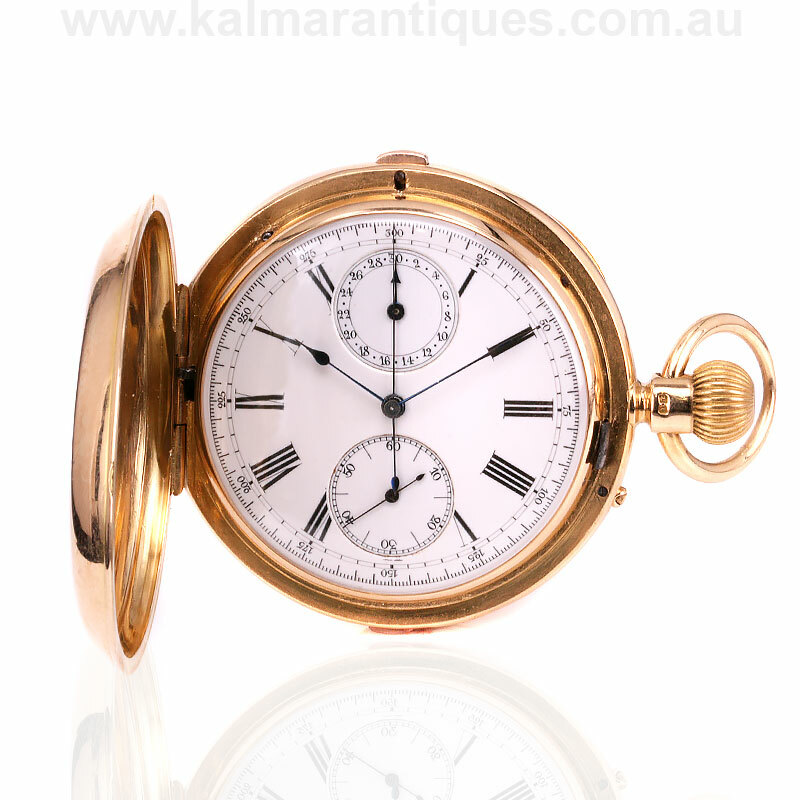 Antique 18ct gold full hunter chronograph W. Bennett & Co pocket watch. Retailed by the Australian company Farmer & Co. 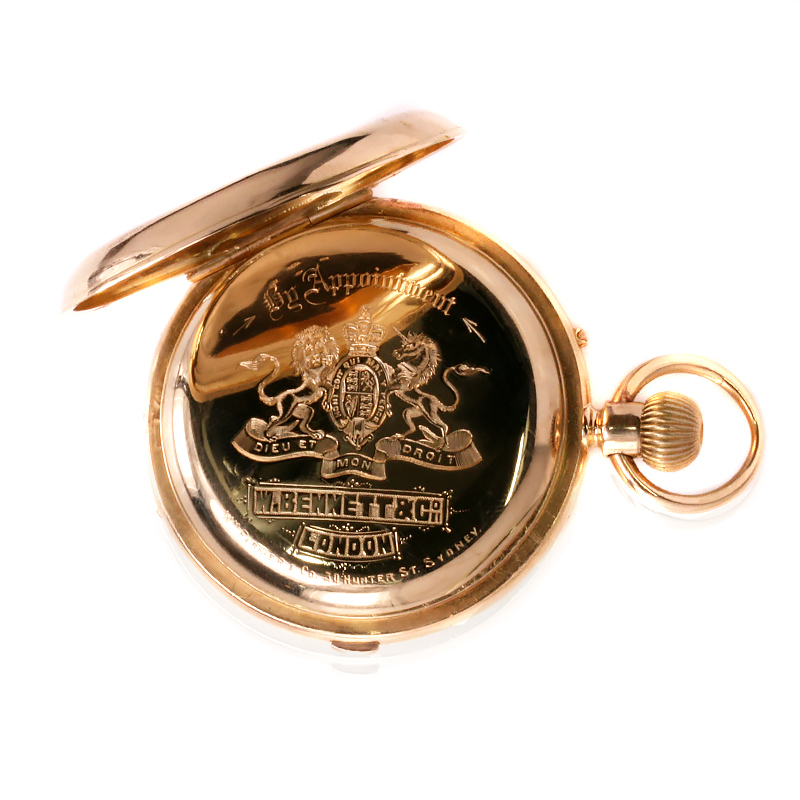 The inside dust cover of this pocket watch is exquisitely hand engraved, including the French phrases “Dieu et mon droit “which means “God and my right” and is the motto of the monarch of the United Kingdom and was adopted by Henry V in the 15th Century. And the other French phrase “Honi soit qui mal y pense” which means “Shame on he who thinks evil of it”. This term goes back to King Edward III, when Norman French was a common language in the UK. These phrases and coat of Arms is commonly seen in the United Kingdom including on all British passports.